As a USPS member you have access to a number of additional items. 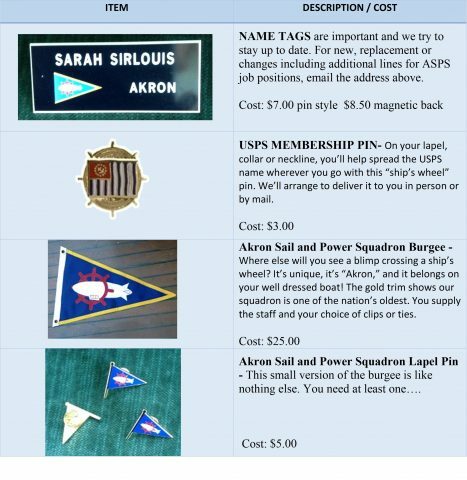 You order these by email to shipsstore@akronpowersquadron.com or in person at a meeting or event (look for the ship’s store person or ask a member of the Bridge). ADDITIONAL CLOTHING ITEMS – are available to you. We can provide lots of items including embroidered caps and sun hats, personalization with your name or your boat’s name, position-appropriate embroidery (“Vessel Examiner,” for example), adding Power Squadron embroidery to things you already own, items with the “crossed flags” logo (the ASPS burgee with the U. S. yacht ensign), and more. Got an idea or a request? Just ask! USPS UNIFORM INSIGNIA – is available too. We have a supply of badges and insignia and we can order other pieces as needed from Commodore Uniform.